Welcome to the second instalment of the Conversations between myself and Lloyd Chambers of the excellent site Diglloyd: today, we’re talking about printing. 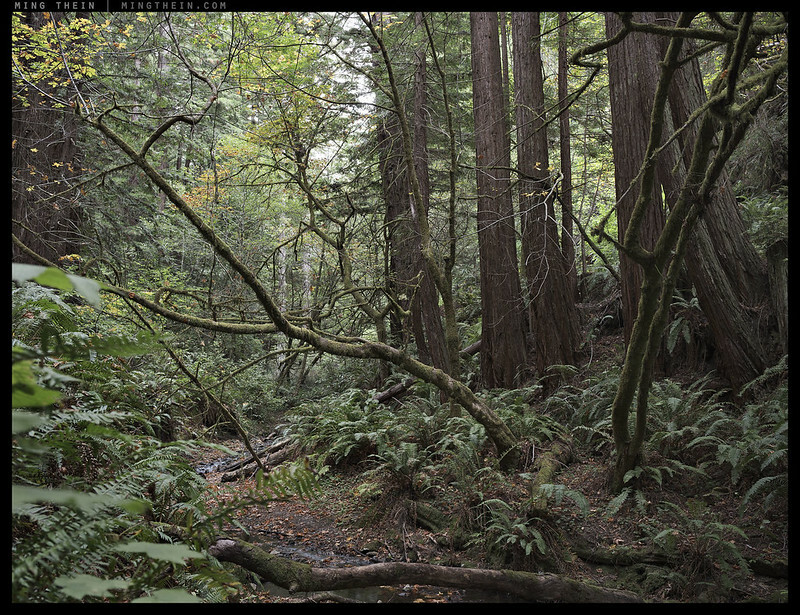 Background: in September, we managed to shoot together for a day at the Purisima Creek redwoods – the image above is the print we’re referring to and one I made that afternoon, and the location is one that’s familiar to Lloyd. It was my first time there. Following feedback from the first instalment, we’ve edited the conversation to make it a little more readable; again it will be posted on both our sites. LC: Ming, I received the Ultraprint you sent me, taken during our outing together at the redwoods. Examining it in daylight (my preference) I took in a first impression which for me means an overall gander (visual impact) followed by looking at fine details, color and contrast and so on. The word “ultra” implies a high level of excellence, so I was intrigued to have that opportunity using an image you shot while not far from me in those redwoods that day so I had some frame of reference (rather than some place I had never been). My first impressions was “dang!” – since I had been there a number of times and the scene you shot really captured the creek and overhanging branches and so on—something I’ve found really hard to do. So as far as I’m concerned it is/was a very successful image consistent with the impressive quality of your other work in other ‘parts. That’s the artistic angle, well done. Technically, there were several subtle things that emerged as I engaged with the image. I first notice a critical sharpness “beyond my eyes” meaning unless I had visual aid there was no point in saying more about sharpness! But beyond sharpness I noted a natural look to the details, a freedom from any harsh edges, transitions, etc, all of which add to the sharpness in ways that make the result really enjoyable. Paper quality is really excellent, too. In addition, the color rendition I know is very hard to get right in that venue, and it was nailed. My only “complaint” is that as I age I more and more prefer larger prints because in less bright light my eyes cannot focus as close. So for me, something around 30 X 20 is much more comfortable. But in this case I was outside and the bright light allows me to view at close range. So! Let’s talk about what an Ultraprint is, meaning what is the photographic goal, general approach, what discipline and care is required and what you hope to achieve by making what is a very high grade print which might be summarize as “like a contact print of old” – only better! MT: Thank you. We’ve tried our best – and continue to do so – to make the Ultraprints the *best* prints we know how, in every way – color accuracy, resolution, continuity of tone – all for one reason: to lead to a sense of immersion and transparency. Looking through the print and at a scene, instead of looking at a representation of the scene, in other words. I chose that image precisely because you had a frame of reference of the actual scene, so you could assess it on its technical merits and fidelity to the feeling of being there. I’m glad it passed – there was a high bar, as I know Purisima Creek is very familiar to you – and it was my first time there. I admit I was probably not firing on all cylinders either; it’d been a very heavy two weeks leading up to that day. The initial goal of the Ultraprint was to condense all of the information from these high megapixel cameras into something that you could actually appreciate at a reasonable scale, and at a single glance – much like the real world. (You can see a detailed comparison between a normal print and an Ultraprint here.) My print buyers didn’t have the space to store or hang larger images – nor do I. We don’t have quite as much space in Asian homes. However, the goal has subsequently morphed from that into a question of bringing the experience of being there to the viewer in the form of a print. Resolution is not the objective, though it is an important cornerstone of the Ultraprint: it enables very fine tonal gradations, which is what represents both spatial detail as well as continuity of tone. I could print the same image at a lower resolution – Ultraprints are now 720 PPI – and there would probably be little compromise on the level of detail *your eyes* can resolve, but it would not have the same perceived continuity of tone. We have to go beyond what the eyes can resolve in order to do that. 720 PPI is at the threshold for most people with perfect vision, at their nearest focusing distance. At this point, we are actually resolution limited by the *paper*; even with the finest grained matte fiber paper with smooth non-expanding coatings, this is about as good as it gets. Which is really not bad, since we can resolve details about 1/3-1/2 the width of a human hair. In a digital context, it’s much like the difference between a normal screen and one of Apple’s ‘retina’ displays – night and day, though you do get used to it. Except the best Retina displays are at 453ppi, and look positively coarse under high magnification compared to an Ultraprint. Back to your comment about size – the only way to go bigger is to have more pixels. And pixel quality is very important too, for both color accuracy and edge resolution – the 12×16″ print you have was made from a D810 stitch of three images, for a total of about 80MP. I am working on a series that goes much larger, and has incredible visual *punch* – but we’re talking about stitching 50+ images to make a 24×60″. LC: Might it be fair to call this an attempt at “immersive” photography by make the viewing experience as free from the limits of recording (capture and print both)? MT: Absolutely. Ultraprinting is a convenient name for an entire idea and workflow: knowing what you can accurately represent in print; then finding appropriate subjects; capturing them with the highest possible image quality and shot discipline, then ensuring that translation to paper is faithful. It necessitates the photographer to sit through endless proofs to tweak color by minute amounts to a (hopefully) accurate memory. The problem I have is that this never translates online: a web jpeg of the image looks terrible because you’ve got perhaps 1% of the information, or less. The irony of course is that in trying to free yourself from the limits, you come across some very prosaic ones – like wind ruining your 60-image stitch…or the fact that you can only use the centre 50% area of your lenses because of corner issues. LC: If I understand correctly, you are adding to the “resolution” (information content) of tonal transition quality, gradient quality of smooth tones and so on. These stitches employ shift lenses I presume so as to avoid parallax issues, since the Purisima Creek Image had severe challenges that rotational stitching would be very difficult to work with (precise rotation about entrance pupil). But with so many images, perhaps not shift lenses? MT: Yes. Tonal quality is also very much linked to resolving power of your output medium: if you have a line, and only two pixels, you can represent that edge with no information. But if you have that same edge crossing say 100 pixels, it’s easy to resolve roughness (texture) contrast (reflections, perhaps highlights) and (irregularity) spatial information. Imagine this now with color information, too. Information is conveyed by spatial frequency, which is really alternation in tone. Resolving power and tonality are not separable, and I think at the core of what changes the experience from ‘looking at a print’ to ‘looking at the scene’. Reality is not single- or posterized-tone; it’s beautifully continuous. Your particular image was made with a shift lens. But most of the time, I don’t get enough shift range to exceed the 80MP / 12×16″ equivalent size; I’ve got to do a spherical stitch. And the reality is that most shift lenses are not up to scratch optically. LC: For these reason, the best lenses like Zeiss Otus contribute to some of the ’transparency’ by preserving as much tonal subtlety as possible? MT: Absolutely. The largest stitches – the Forest series – are made with Otii or the 2/135 APO, which is pretty close. Capturing as much information as possible and as accurately as possible is very important; that’s both color information and resolution. Our subconscious is very sensitive to color; it will register something as being ‘off’ if the balance isn’t right. This is especially critical with natural subjects as we have a very strong concept of what color grass or sky should be, for instance. LC: There you have it over me—I’ve done the color tests and I rank quite high (in a percentile sense, 99.9%) – but as my eyes age they are less good. Back to the artistic side, many coveted prints are technically not so great. But they succeed because of ‘message’. What is your message? MT: On the artistic side, it’s not so much a message (that can be down to an individual project; e.g. ‘Verticality‘ is about the smallness and insignificance of the creator in the world he has created’) – as an experience. The prints are about the experience of being there – or as close to it as we can get. And if I can take you to places that aren’t so easily accessible, but which perhaps convey a nice sense of calm (forests, for instance) then it becomes a unique little portal of escape you can hang in your home or office. LC: Let me play devil’s advocate: “immersive” to me means something around six feet wide. But I only have wall space for 3 or so such prints! Call it “like life” or “larger than life”, I have trouble getting into prints smaller than about 3 feet wide, regardless of the artist. Which is partly physical (eyes), but otherwise just what I like most. Photographs are successful for many different reasons: historical or famous, subject alone (place, time, celebrity), but some photographs lack such references and thus have to stand on their own, and that mean artistic excellence and ideally, technical excellence. So the “portal” you speak of seems to aim for the latter, it being a bit harder to round up famous people or historical events! So by what metrics of success do you judge your work, given the above (or other)? MT: I’m going to ask you a question in return before I address your other points: did you get immersed in the Ultraprint I sent? LC: No, because it is too small, and the place is large and cathedral like. I respond very strongly to large outdoor spaces (see all my mountain shooting). At relatively small sizes (16 inches for that print), the print is excellent, but I cannot be in the scene at a small size. This is true totally in general and not a comment on that print. I want to feel like I’m there, and I don’t feel that with smaller prints. I should explain a bit more— when I’m in one of these “cathedral space” outdoors (redwoods, wide open mountains, etc), I have an almost 3D sense of the place, and it is multi-factorial: sight, sounds, touch and so on that all wire me in. In a way I visualize the place *while there* and when I’m zoned into it I am conscious of the place as a whole. It is very hard to get close to that even in a large superb print. After all, this is a 2D medium. So the best approximation of the feeling of a place needs to get to some wider visual field of view (I am strongly visual dominant), and for that I (*I) feel the need for large prints. MT: That is an eyesight challenge; a larger print simply occupies more of your field of view. The same thing happens with a smaller print, except your eyes tend to run out of focus distance first and prints tend to run out of steam at an absolute resolving power level. I’m seriously going to suggest you try it again with reading glasses 🙂 Remember that the original gestation of the Ultraprint was because large prints are not practical for cost and space reasons. That, and it’s also really difficult to pick one image you could live with for a long time to the potential exclusion of others. But it is one of the reasons I’m going larger with the next series of Ultraprints – I hold that level of detail out to much larger sizes; Forest III was the first of these at 40×15″, and I plan to go as large as about 40×40″. Most of them will be panoramics precisely to give you this sense of exceeding your visual field of view, intended to be viewed from about a foot or foot and a half way. But this of course reduces the potential audience because of size and cost…and makes it very expensive to even proof properly. I’m confident you’ll get your immersiveness at this size, but with significant other compromises. To answer you question about standing alone and judging work – I have to go back to the original objective. Does it feel immersive? Do I feel like I’m there? If not, then it doesn’t work. This of course assumes that the scene is one that I want to be present at in the first place – a smelly garbage-filled alleyway in the middle of the night is probably *not* something you want to be immersed in. But realising the size conundrum, I agree that I need to go bigger. 20×30″, at least. This of course limits subjects too since I have to stitch. A life-size wave would be awesome, but impossible because I’d need a single capture array of at least several hundred megapixels. LC: I’d agree that reading glasses would help just to be able to get closer to a smaller print (field of view). Can also work in very bright light. Well, this would not be an issue at a younger age and I do not say it is how others might react. I certainly was drawn to the clarity and real-ness of the image! I think in a way it is “user interface“: how much viewer effort is needed. Another example: going to a museum, I love the large late 1800’s painting that are huge wall size things. I walk on by the 1-2 foot images because they just seem to require too much effort, uneless the museum allows close inspection, which helps a lot (some don’t). MT: You can get as close as you like to these. Even the large ones. And the large ones are very surreal when examined like that – they work both at conventional viewing distances and with a loupe. I honestly wish I had the museum problem with these, though – then we’d just calculate what the resolving power of the eye is at minimum ‘velvet rope’ distance, exceed it slightly, and see how big we can go! LC: Well, the print is terrific. And big is wrong for some small places. Posing a “future” question: what if we had digital wallpaper of print quality? The same quality metrics ought to come to bear and distinguish between the Ultraprint grade and ordinary. MT: Hah! I’d be the first in line, and I think it probably isn’t that far off, actually. I’d also like a ‘white’ setting so I can use it to construct light for still life work. But it does say to me that since I missed the mark on immersiveness for you (albeit due to ageing eyesight), there’s still room for improvement. Next time we meet I’ll bring a large Forest. Interestingly, as good as the iMac 5k is, it’s still only 218PPI. LC: But 218ppi at 2 feet is pretty darn hard to see pixels. So to bring it back to the print and setting aside my own eyes – the Ultraprint captures a level of detail that is pretty incredible and influences my perception of it significantly. Also, when I studied it at closer range, yes it was immersive in the sense of bringing a smile to my face in seeing all the details there and to be explored. I confress I am looking forward to the NEC 32” 4K display just because I love such details. So let me call it “highly engaging”, because I took the word “immersive” more literally. Readers who have not viewed an Ultraprint ought to—and I might be remiss in this regard in being too out of hand —ordinary prints show limits that just are not there in the Ultraprint. Setting aside professional excellence and pride in making the best possible print (kudos), do you think most people appreciate the degree of effort that goes into the prints? Might it not take 5 or 10 or 20 years for the core concept to really break into its own form? MT: I’m sure we’ll get to immersive, even for the long sighted – it’s a matter of size. But I wouldn’t want to compromise in any way because *I know it can be done* – and anything less would just defeat the point of attempting to push the boundaries of perception in print. You’re probably right: most people have no idea how much work goes into making a finished print – from the 60-image stitches with thousands of manual control points to the dozens of proofs to the modifications to the printer. And because I cannot translate or even begin to convey the physical viewing experience digitally, I am sure it’s being dismissed summarily by a lot of people who might otherwise enjoy such a print. It’s very difficult to imagine if you’ve never seen one in person, and physical limitations mean it’s obviously not practical to send these things around as samples. Plus the paper surface is of course delicate and doesn’t respond well to excessive handling, much like any print. There are plans for an exhibition in Chicago in October next year at the Rangefinder Gallery, and another one tentatively on the cards for Hong Kong in November; hopefully I can get a few more places interested. Funny thing is most of the skeptics have become very vocal converts after seeing the prints in person. The good news is that as display pixel density increases, I think people are going to find it easier to imagine and visualise what 720PPI looks like. LC: Corollary: your compositions are always very strong. And that is the first thing that makes the image. Would you print an image not at Ultraprint resolution grade and really worry in any way about it, given the right composition? Photography has plenty of not so sharp images coveted by collectors. Would I print strong images that don’t make Ultraprint grade? Sure – either as smaller Ultraprints, or with very clear caveats that it is not an Ultraprint. Sometimes the idea and the moment outweigh all, and you only get a single capture. Stitching for ultimate resolution is nothing new, of course – so it should be that hard to understand. The difficult part to understand is the consistency of vision/ idea that goes into the workflow to make the most of the medium, and the fact that we can really put down all of that information into a sensible-sized print. LC: The Ultraprint quality goal intrigues me, because I’ve long felt that if I’m going to make an image, I want to capture it at maximal quality (resolution, color, dynamic range, etc). That dynamic seems at work for you too. But today cameras are “good enough” meaning that the whole Ultraprint goal is not a priority for many shooters. They’re not stitching and they’re shooting, say, 16 megapixels. What say you? MT: Here’s my question: if you have all that resolution, what are you doing with it if not printing? There’s actually no way to view even the output in full. This, plus the size and cost limitations of large prints are why we have Ultraprints at all. It felt like something was missing from the prints – at all sizes. I could *see* through them, in a way, and that sort of ruined the experience for me and made me unhappy with the output. Finding a print master who will also support you through this is another challenge entirely, of course. LC: Who is your printer? MT: I use Wesley Wong at Giclee Art in Kuala Lumpur – I actually interviewed him here a little while ago. We both decided we could go further with the output – and he is my indispensable partner in the creation of both the Ultraprint process and the prints themselves, and a very close friend. LC: Any advice for those looking to aim for Ultraprint quality? LC: How can someone buy an Ultraprint? MT: I offer a selection of prints via my gallery site and the main site, or you can request any of my images from here or the flickr page as an Ultraprint here – note that not all images are Ultraprintable because of technical limitations, and sizes are may be restricted. As for the editions on the gallery and main site, I strictly limit the number I print – simply because I believe in exclusivity, and because I also believe that I’ll also make different and better images in future – it’s an evolution. Smaller sizes also mean better accessibility price-wise. LC: You do teaching/workshops, are you offering one that dovetails with the Ultraprint goal? MT: Back to translation of idea into capture, and capture via workflow into the highest image quality possible with your equipment – and all of the intermediate steps. I generally bring some prints because students are curious to see them; once I show the workflow then they have an understanding of just how much effort goes into creating one of these images. But it all still goes back to the photographer: a poor idea is going to make a mediocre image regardless of the capture and output. So I tend to focus on the conceptual and compositional parts before output. LC: Thank you Ming, for sharing your insights and clarity of purpose. A selection of limited edition Ultraprint images is available from The Gallery; in addition I am planning future large format editions in the Forest series, which will be announced here. The next image will be Forest IV, shown below and available in early January as a 57×22″ Ultraprint. Further reading on the Ultraprint can be found here, in the rationale behind the pursuit of clarity. Very eager to make the trip down to Chicago for the gallery. When will you be announcing the dates? Thank you! The exhibition is provisionally from 1 October. so you simply reformulated the concept of contact printing… but in digital. Given the small size of the captors today you are obligated to stitch enormous panoramas… A digital workflow has still a LOOOOONG way to go to reach the possibilies and the output quality of a large format film. Unless you’re using perfectly planned and calculated method of of shooting using a huge and costly pano head and, you’re leading to a lot of deformations and quality alterations (not even talking about ghosting effects) to get to the aproximation of a good stitch of your digital negative. You’re talking about your good printed pixels, but how much have them been twisted to get to that result… Have you ever contemplated a 8×10 contact print or a Ciba print ? I haven’t seen your ultra prints, this is an Interesting idea, but no, I’m not buying that! Actually, I have. The current generation of medium format sensors is so far ahead of 4×5 it isn’t funny. And there’s no way you can get a contact print that large from 8×10. ahhh so your digital medium format is so far ahead… technologically of course! qualitatively that’s a totally different matter. Please don’t go there it would be so ridiculous, or put your best print “ULTRAPRINTED(tm)” next to a large format C-print or Palladium. So, what you’re saying is that all stitching must be bad? I don’t buy that either. Also, I think we shouldn’t confuse stitching with Ultraprinting. Stitching is a means to get more pixels for larger print output. Ultraprinting is a proprietary print process to obtain unbelievably fine detail in the final print. An Ultraprint at 720 dpi from a single Nikon D8xx series file can be up to about 10 inch on the long edge. I’m not confused, I’m saying that printing at a very high density is very limitating in output size, going beyond is made by stitching several images. And then : “I am working on a series that goes much larger, and has incredible visual *punch* – but we’re talking about stitching 50+ images to make a 24×60″. and you’re saying that after all this “superiority” of the digital the very best sensor in the market is capable a 10in print..
12×16″, but yes. Remember you need overlaps for stitching, too. Hence the 24×60″ output from 50+ images. Unfortunately. I have not seen one of these prints on person. But I’ve read all of your posts about them. As much as I love your ideas regarding the ultra print. I don’t find it’s your stronger work that can support them. I feel like Lloyd was being kind when he told you his thoughts. He seemed not to he as immersed as you’d expect people to he. And I think Thats because of the images themselves. Its like this. Oh boy! I can see all he detail in the bark of the tree! But I still don’t feel I’m there. You’re a good artist Ming. I wish these prints could convey your art. And not your technical prowess. You can’t stitch spontaneity. There’s no single capture device with enough resolution to make large Ultraprints of unplanned, handheld events. Perhaps eventually – but this is a gap for now…and the image must therefore complement the output. You know, for all your self-professed technical mastery of the digital medium and your high-minded, pedantic jabber about “Ultraprinting,” the photographs on display here are just so boring, Ming. Brings to mind your buddy Lloyd Chambers’ images! Technically passable, but depressingly uninteresting on every measurable level. It’s the work of stodgy middle-aged men who possess far more money than talent. Funny thing is, you actually over-sharpen for the viewing size. Damn near injured my eyeball on one of those artifacts. Which is surprising, because you’re a Master! Right? But then why do you so often shoot vertically like a soccer dad with an iPhone? Good god. It’s heinous. All that beautiful gear in the hands of a man who abuses it. You’re a camera abuser, Ming. For shame. I pity your Otuses. – finally, it’s clear you know nothing about photography since you don’t understand that you have far more control over perspective and foreground-background relationship when you shoot vertically. I suppose you think every single artist who painted vertically was a ‘soccer dad with an iPhone’ – or are you merely projecting your inability to see onto me? I pity how boring your world must look. Pls ALL should keep the ball flat! It is a normal discussion only, and I would never say something negative, if I’ve not personally seen it! I have no DOUBTS, that the ULTRAPRINTS are excellent, but, many ways are leading to Rome, and other mothers have also nice daughters! Some people stating for example, that the LEICA monochrome is the peak in B&W, but I’ve seen B&W prints in such an excellent quality, made from other regular digital cameras, which must not hide behind an LEICA MM! Uhhh, Rainer, please read carefully. 1. I was not addressing you, but only “honorable garden, who certainly did not engage in a normal discussion. 2. I did not state anywhere that Ultraprints are the only way to go, only that it needs to be seen in real life to be fully appreciated. I agree, but making a judgement without seeing something bothers me, and accusing me of ‘soccer dad iPhone technique’ without understanding why a vertical composition aids perspective is just plain wrong. Alas, unlike “honourable gardener”‘ I have not seen one of Ming’s Ultraprints yet, so I cannot really pass judgment on their technical or artistic impact. And of course, having not seen one, I most certainly couldn’t, credibly, spew obnoxious vitriol regarding the object itself. And finally, even if I had seen one, and found it, personally, uncompelling, then I would confine my comments to a constructive, civilised explanation of why I felt that way, whilst having the humility to concede that this was just my opinion, and should in no way be construed as The Definitive Judgment. This assumes that I would say anything at all, because frankly I am not of the opinion that the world, or even the readership of this blog, give two hoots about what I think on the matter, clearly “honourable gardener” is not burdened with my particular flavour of self esteem issues. What I would never dream of doing, in normal circumstances, and self esteem issues aside, is engage in a personal attack on an individual, regardless of medium. And, finally, I would not do so under any moniker using adjectives like “honourable”, nor for that matter “noble”, “civilised”, “credible”, unless I was trying to be ironic, but then that would just make me a troll surely? I’m sometimes surprised at the comments Ming lets through, and this is one of those times. I think it speaks to Ming’s integrity and belief in what he’s doing that he’ll address even the stupidest comments like this one. Thank you, Ming, for the interesting article and a very interesting discussion in the comments. I wanted to ask you and the readers of your forum about the best printing service available in the US. Usually, when I come to the printing shop and inquire about their printer’s resolution they start asking about how large I want the print to be, and in the end of the conversation they tell me that they will print it at 150 dpi. They either do not understand the subject or try to cover the limitations of their equipment. I am still looking for a service that would be able to print at 600 dpi and the size from 11 by 17 inch to 30 by 40 inch. No luck yet! Experts telling me, above 300 dpi is useless! What ‘experts’? I think you can see clearly with your own eyes here that there’s a big difference between even 360 and 720PPI at normal viewing distances. Optical experts from ZEISS, by the way! I guess, the PC monitors of various types, size and brands, cannot be an good tool to prove any data for final print qualities! But anyway, the majority is watching the images on their normal PC etc. Even 300 ppi images may by converted through a RIP for much more dense dot placement. The argument of some if that image resolution should closely match printer dot placement, at least with inkjet printing. The best reason to do so is to better mimic continuous tone. Just for an example, a blue sky does not have that much fine detail, but it does have a very fine change of tonality. Placing more dots can improve the perception of tonal changes. I’ve seen this in commercial printing too, where the printing negative or plate may be produced with a 2400 or 2540 dpi output. The argument there was to use a multiple that easily fit into that output. Frequency modulation and other stochastic processes altered that, because even finer detail is possible. There are other variables involved for going beyond four colour process, and I have seen some amazing 6, 8, and even 10 colour printed examples, though these things are rarely used. Any commercial printing place can accept 600 ppi images at the final printed dimensions. Whether or not you see any difference without using a loupe is a different matter. If doing inkjet outputs, my recommendation is to use the file prepartion suggestions that the printer operator suggests, because a good printer should know their equipment very well. Sorry, no idea. I don’t use any printers in the US. Well I find the ultraprints quite immersive at the smaller sizes 🙂 . Forest II was pretty good, still my favorite. Sadly running out of wall space, but I still need to buy a 3rd generation print! I haven’t tried them or even reviewed the specs but suppose VR goggles would be “immersive” in terms of field of view. A bit of technical information, without getting too deep into printing specifics, paper, ink, and dot gain. Inkjet printers capable of 1 picolitre minimum droplet can resolve details as small as 20 µm (microns). A 1.5 picolitre inkjet drop could resolve 30 µm (microns) of detail. This assume minimal dot gain, though in practice papers rarely ever have an effective 0% dot gain. There was an experiment at RIT (Rochester Institute of Technology) several years ago to test the affects of using 0% default dot gain setting against the default Epson dot gain setting, with the result showing extremely little difference in tonality. Another function of dot gain involves tonality and colour perception. Each different colour of ink also has slightly differing dot gain on the same paper, mostly due to characteristics of the ink. If we were to look at image sensors, we would find that a Nikon D800/810 has a 4.8 µm (micron) pixel size. If we were to use one pixel of information per dot of ink, allowing for dot gain, then a 1 picolitre printer could utilize 4x the size of the sensor for maximum output, and a 1.5 picolitre printer could make use of 6x the sensor size as output, or roughly 4″ by 6″ and 6″ by 9″. Unfortunately that doesn’t present a useful nor realistic output. A 90% Black or Magenta output like that would create a solid colour output with no gaps, while a 10% Cyan or Yellow output like that would show some small gaps under a loupe. So we are on to looking at the stepper motor as a guide. Many inkjet printers are using stepper motors that move in resolution output relative movements equating to 720 dpi mulitiples (720, 1440, 2880, etc.). So the output idea prevalent in inkjet printing is to use 720 dpi as the file resolution. There are 25400 µm (microns) per inch, so at 20 µm (micron) size this represents 1270 dots per inch on 1 picolitre systems, while 30 µm (micron) detail capability would equate to about 847 dpi on 1.5 picolitre inkjets. A technical argument could be made for printing smaller than Ultraprint™ sizes, to factor in dot gain, ink drop sizes, and resolution capability matching. Anyway, if anyone has not fallen asleep yet 😉 there are other reasons why these things are rarely done, outside of academic circles, or equipment testing. (side note here: I spent several years working in commercial printing) If we look at paintings, a notoriously low resolution endeavor, we can see a few factors at work. One is relative scale, in that we can paint to show things smaller than lifesize, lifesize, or much larger than lifesize. There is a psychological aspect to each relative scale; I immediately thought of this when seeing the word “immersive” in this conversation. Another factor in painting is that the mind’s-eye of the viewer will fill in details; what this means is that we only need as much information as the viewer needs to trigger memory or recognition of an object or scene. So functionally in painting, we don’t need the creases and pock marks of skin to assemble a face in our minds, nor do we need every vein of every leaf on every tree to know we are seeing a forest. 😉 I have tons of samples of the best in printing, from a multitude of devices, yet I still enjoy the low-tech of painting. Obviously we like photography for the ability to render details. On a technology level, D800 Nikons and Ultraprints™ are on the bleeding edge. There is a certain attraction to this bleeding edge. I’m impressed by the accomplishments, yet I am left with a conundrum. When we have so much in details, more than the eye and mind of the viewer would see had they stood in the same place, then I think we are losing out in the experience. Obviously in our ADHD saddled society, providing every last details would seem to be a great way to create greater focus upon the end results. What I think we are losing, is that the viewer does not need their mind’s-eye to fill in the details. The engagement of a brain trigger is missing. Thanks for the technical support. However…I will say again you really need to see one in person before making a judgement. I do enjoy viewing many of your images. Also, you’ve tightened the workflow for all steps and aspects. That precision is evident in the work you do. All together a technological tour de force. Few would attempt to emulate your processes in total, and this is the uniqueness of your work. Perhaps I am not understanding your descriptions of all this? I’ve seen printed output as you have described it, and I even went back to re-read the Wesley Wong interviews, in case I missed something. I get the impression the difficultly level is extremely high, but not out of reach of duplicating. I think you get me wrong in this. I’m impressed by the technical achievements. Maybe I’ve become jaded by seeing so much, that it is becoming a blur. 😉 When I saw the GigaPXL project images, even through the loupe provided by the museum, those images failed to make a connection with me. I may be way different than many others in that I want that mental connection and triggering of my imagination. When I saw Burtynsky’s prints, I was blown away by his images. When I purchased the Burtynsky book “Water”, I’m just amazed by the images. As you describe it, your Ultraprints are at a higher level than that Burtynsky book. I’m at a loss at how I should compare those things? The human eye can separate max. 12 lines per milimeter, but I doubt, that most people do not have this capacity, or not anymore. I is also important, from what distance you look on a poster size image. Many years ago, pure light has projected the image onto the photo papers, today a number of at least 300 dpi = dots per inch is mandatory for a good sharp poster size prints. What is more precise, projecting light or laser light projecting the image per an special enlargement lens onto the photo papers, or inks get sprayed precisely in dpi = dots per Inch, on the special ink jet papers? 12 lines/mm at what distance? It’s obviously unfeasible at 100m, but at minimum focusing distance for a person with perfect eyesight seems a bit low. I think ultimately both optical and inkjet prints are limited by the paper – the fiber structure becomes the limiting factor and the limit for the finest possible detail. I not sure, it should be 12l/mm in a normal distance of 25cm! Dr. Karl Lenhardt, of Schneider Kreuznach, in a paper about optics for digital imaging, put it in the range of 6 lp/mm at 25cm. I’ve also seen 8 lp/mm expressed for the same distance, for some individuals with exceptional eyesight. Commercial printing technologies can place 20 lp/mm to 40 lp/mm of details, though the additional details are not seen nor recognized by the human eye. Indeed, even 10 lp/mm on a printed image just cannot be resolved by the human eye without assistance. The idea of placing more details than visually possible is to try to mimic continuous tone. C-prints are already continuous tone, as are silver gelatin prints. In commercial work I use to go more often to do print and proof checks. I carried a printers loupe with me all the time. The first place I would check was the lighter areas, because they were thinner with the volume of dots on the paper. I’ve inspected frequency modulation and stochastic prints under a loupe, and it is easy to tell how they surpass the older line screen techniques. More dots, variable dots sizes, variable dot placement, are all ways to improve the appearance of continuous tones in a print. Inkjet principles are the same, though the actual ink has different characteristics that create larger dots. The basic idea is that enough dots, variably sized and placed in a more randomized manner, will be very close to continuous tone. To the average human eye, at average expected viewing distance, the affect can be very impressive and convincing. Back when the budgets were better, and the clients cared more about quality than expense, I use to hunt for the pinnacle of printed performance. I use to go on print checks, press checks, and gather up white papers and examples of everything being made or tested. I still keep up to date, but now it is the rare client who pushes for the highest quality prints. The same goes with papers. Once you know how to select and grade papers, the quality potential can be pushed higher. Unfortunately even there clients look to save expenses and sacrifice some quality. Fine art is a different realm, though few are generating a profit from the highest quality prints. For me personally, the ILFORD CIBACHROME printing system, is the best i have ever seen! But I don’t know, about LASER prints! Four colour carbro is quite impressive, though even rarer than Cibachrome. The other popular method for high end art prints is Diasec mounting. None of these are low cost. There are people who can focus closer than that. My minimum is about 12cm. Yes, I too can focus closer than 12cm. The 25cm distance is considered the normal viewing distance. This was established for commercial and photographic prints decades ago. Dr. Lenhardt was noting a viewing distance that has been used for quite some time, though he’s not the only one. You’ll find most of the German optics makers, and many of the commercial printing machine manufacturers use the same 25 cm distance in their calculations. I suppose is depends upon whether you want to make something for the few with very good close up vision, or for the average person. When I go to gallery exhibits, it is extremely rare for me to see someone get extremely close to an image, unless the image is quite small. I do sometimes take a printers loupe to a book to check the printing, though I doubt many other people do that. Gordon, from what you’re saying, it sounds like others have printed at these resolutions? Anyway, I think good artists have always pushed the materials they have on hand to their limits and beyond, and new materials have always inspired artists in the past to grow beyond their current abilities. I think Ultraprinting represents a new frontier that challenges photographers everywhere to exploit its resolution. One could always print very large (eg. Gursky, Burtynsky, etc. ), but I think more interesting results will come from less obvious uses of this resolution, like perhaps more unconventional subjects that were previously considered unphotographable. Ming is trying his hand at doing this for highly detailed scenes that one can explore after the capture, and in greater depth than has been done before. Definitely there is a danger of chasing after technical unicorns, trying to figure out how many line pairs can dance on the head of a pin, but I think photographers should instead view this as an opportunity to explore new ground, and as a challenge to grow their artistic visions to take advantage of this new medium. If I’m not mistaken, Wesley will Ultraprint for other photographers as well, so this seems to be relatively available to everyone. Agree with most of your points Andre. What’s interesting is that I have seen many photographers venture down this same path. It may be the evolution of many photographers to push the technical boundaries. There are others who have printed at these resolutions, and even higher. An HP, Epson, or other wide output inkjet, running a RIP, can be set in many ways. It’s within the realm of individuals to attempt, though as Ming notes above, be prepared to go through numerous proofs before you get what you like. File preparation will differ because as you place more dots, the tonal values change. Lots of trial and error. Ming is to be commended for all the effort he has put into making these prints. Commercial printing is another realm. The limits of visual details can be pushed extremely far, if you have a client willing to push the limits. Creo Staccato was capable of 10 µm (micron) dot sizes in 2002. I have some wonderful samples from that process, and some later technology that allowed even finer detail. Commercial printing inks have less dot gain that inkjet, so finer details are even more attainable. The problem, as I mentioned above, was that few clients wanted to go through the time and expense to use these things. Most of the ultra high resolution commercially printed samples I have were commissioned by luxury goods companies, or paper companies. Very few artists use commercial printing technology for fine art print making, though there are some interesting applications of the technology. Thanks for the additional information Gordon. Speaking of commercial printing processes, didn’t Eggleston pioneer the use of dye-transfer printing as an artistic medium? Maybe it’s time for another photographer to do the same thing for current processes. I don’t mean to troll, but I’m curious why you would allow out of focus plant leaves to fall into the scene in an Ultraprint? (bottom left corner). In my mind these ultra prints start from the moments prior to image capture with time spent assuring proper focus and composition. Maybe you meant for the leaves to be out of focus, in that case I would love to hear the theory behind it, or you just didn’t notice it before you posted it online. Anyways, I enjoy your site and reviews. Hi Ming, unfortunately, I have not seens yet any ULTRAPRINT in nature! The sharpest image print material I have ever seen in this matter, was the ILFORD CIBACHROME, with the KODACHROME 25 slide film! It was not a paper, it was a sort of a plastic foil! Unfortunately, ILFORD had to stop the production of this special chemicals and Cibachrome “paper”, because of vital polution problems, similar to the chemical problems with the one and only Kodachrome slide film materials! I just have one Cibachrome print 8×10″ left of an family image, which I’ve done approx. 35 years ago, without any change of colors! The sad reality of Cibachrome and four colour carbro was that they were time consuming and expensive to use to produce prints. Inkjet became by far much more accessible and repeatable for most end users. I think we are well past the point of acceptance, given the volume of inkjet prints out in various galleries. C-prints and silver prints are still shown, but even they are becoming more rare. The more I look at the first photo, the more I like it! But I wonder if the strong feeling of a living growing forest might be more clearly expressed in a B/W ultraprint – with a different kind of immersiveness? More like an image of Forest than of This Forest? Maybe one needs some B/W experience first? We grew shooting B/W and watching B/W films, both rarer nowadays. I’m perfectly happy with B&W, but it seems the buying audience wants it in color. On the other hand, the second photo also looks great in B/W, but I certainly prefer it in colour for all those lovely shades of green. (whereas in the first photo I think B/W emphasizes the stems and limbs of the trees). I have seen many times how the power of Ultraprints spontaniously leads my guests of the house directly towards the walls they are hanginging. Viewing the Ultraprints always releases a *Wow .. this is like being there. Did you take that? * Heh .. yes I wish I did, but .. and then the story folows of course. The goal with my own printing is to show photos to where your eyes can go and take you out of the everyday turmoil and leave you time to contemplate, meditate or just take a 10-20 seconds brake which often is enough to settle thoughts, feelings or heartbeat. I like images which seduces me. Take me to another state of mind and change my present mood. The Ultraprints shows an almost magnetical power to take you into the image. At times a hypnotic experience that feels natural and effortless, makes you feel warm inside. I can’t help comparing the experience to the difference sitting in your favorite chair and enjoying a piece of 3 dimensional recorded (often live music) music on a super highend audio sytem and then the experience you have being there at the musical event yourself. There’s a normally big difference. But the higher quality the recordings are and the more perfect the audio system is composed, the closer the two experiences comes.